A public record obtained from the Panama’s corporate registry reveals that a division of the Ministry of Economy and Finance has requested information on three corporations linked to the former Emir and the former Prime Minister of Qatar. 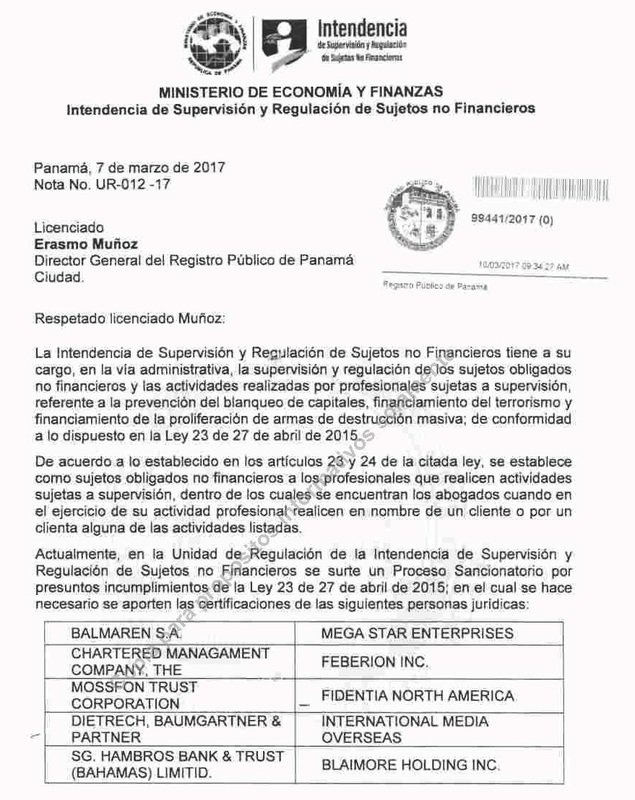 On 7 March 2017, the Intendance sent a letter to the government-run Panamanian corporate registry stating that its regulatory unit had “filed a Sanctioning Process for alleged breaches of Law 23 of April 27, 2015” and required information on 34 firms – including the names of directors, legal representatives, and resident agents, in addition to addresses of the companies and corporate charters. THE CHARTERED MANAGEMENT COMPANY FEBERION INC.
SG. HAMBROS BANK & TRUST (BAHAMAS) LIMITED BUMMORE HOLDING INC.
MOSSACK FONSECA GUATEMALA	 BRODWAY COMMERCE INC.
GOMEZ-ACEBO & POMBO DELANTERA FINANCIERA S.A.
GESTRUST S.A. DREX TECHNOLOGIES INC.
LEGAL ADVISORS S.A. HAZELVILLE INTERNATIONAL INC.
WILDGEN AND PARTNERS RENTON MANAGEMENT S.A.
IAN, S. FFRENCH FCA NOTART CONSULTING S.A.
MOSSACK FONSECA & CO (UK) LIMITED KNIBOS CONSULTING S.A.
RAWI & CO YALIS S.A.
CHILD & CHILD ORBIT FINANCE S.A.
Based on the companies referenced in the document, it appears that the Intendance has been investigating many of the firms for their links to a controversial Panamanian law firm called Mossack Fonseca. The International Consortium of Investigative Journalists (ICIJ), published a trove of 11.5 million leaked documents from Mossack Fonseca in 2016 called the “Panama Papers.” The documents exposed over 140 politicians from more than 50 countries connected to offshore companies in 21 tax heavens. And the ICIJ has publically provided a full database of the papers’ contents. That database provides extensive information about Qatar’s royal Al Thani family including the former Emir of Qatar Hamad Bin Khalifa Bin Hamad Al Thani and Sheikh Hamad bin Jassim bin Jaber Al Thani—the former Prime Minister of Qatar (2007-2013) and CEO of the Qatar Investment Authority (2005-2013). The two men were, respectively, Qatar’s head of state and head of government until 2013 when both men formally retired from their positions. The Panama Papers link Sheikh Hamad bin Jassim (or “HBJ”) to eight corporate firms in jurisdictions widely regarded as tax havens. Those eight corporate entities include three found on the Intendance’s list: Knibos Consulting S.A., Notart Consulting S.A., and Yalis S.A.
DE-Tenants.org had already begun exploring these offshore firms in previous posts (see HERE and HERE and HERE). One of the firms listed in the Intendance letter, Yalis S.A., was 75% owned by the former Emir of Qatar, Hamad Bin Khalifa, as of July 2013. HBJ owned the other 25%. No publicly available evidence indicates that they divested from Yalis, however, the firm dissolved in December 2017. Knibos Consulting S.A. and Notart Consulting S.A. remain active firms. Readers will remember that, in the early 2000s, HBJ was at the center of a money laundering investigation (see HERE and HERE) by the Attorney General of the British Isle of Jersey. Jersey authorities accused HBJ of taking payments from the British defense firm BAE Systems. Investigators closed the case following a voluntary, £6 million settlement payment to Jersey authorities. HBJ admitted no wrongdoing. The Emir and Prime Minister’s corporate assets were included among an interesting cast of other firms on the Intendance’s list. For example, Feberion Inc. was linked to infamous 1983 Brink’s-Mat heist of 3.5 tons of gold bullion worth £80 million today. Feberion Inc. laundered the proceeds of the robbery, according to the Guardian. International Media Oversees was linked to Sergei Roldugin, a close associate of Vladimir Putin. It is speculated in Western media outlets that Mr. Roldugin manages Putin’s personal wealth. (See HERE and HERE). Drex Technologies Inc. of Panama has a similar name to a sanctioned British Virgin Islands firm Drex Technologies S.A. which is linked to the cousin of Syrian dictator Bashar al-Assad. Delantera Financiera S.A. was linked to the aunt of King Felipe VI of Spain. Mega Star Enterprises was connected to Lionel Messi, one of the most popular soccer players on the planet and a convicted tax dodger sentenced in 2016 in Spanish court. UF Universe Foundation was linked to Azerbaijan’s ruling family. Our next post will walk readers through how we obtained this public record.